Is is possible to have numbers from 2 frequent flyer programs for 2 passengers on the same reservation? I've just booked a flight from Canada on Air France for myself and another person, on the same reservation. We have frequent flyer memberships with different programs (Delta Skymiles, Aeroflot Bonus). Both programs are from Air France partners. I booked directly on the Air France website. 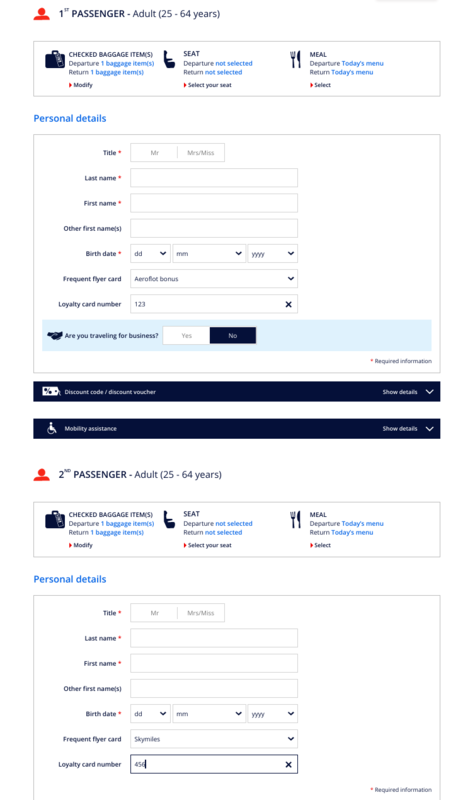 When trying to add our frequent flyer numbers on the Air France website, it did not accept the numbers for some reason (no error message, numbers just are not being added). When I called the airline, the phone agent informed me that they can't add numbers from two different frequent flyer programs to the same reservation. This seems really strange to me - I've never heard of such a restriction with any other airline before. Is this a real restriction? If so, where is it documented? It is at most a technical limitation in the system. Frequent flyer miles are given to the person physically flying, not who paid the flight or who owns the credit card or who made the booking, so the common booking is of no impact. The easiest way is at check-in, each one have the agent enter his/her respective frequent flier number. You could even do it after check-in, behind security (when you typically have a lot of time left), at the service counters. Not the answer you're looking for? Browse other questions tagged air-travel bookings loyalty-programs air-france or ask your own question. What is the typical ratio of paid versus free miles in frequent flyer programs?